Selecting a customer relationship management (CRM) system is a big business decision that can impact your organization for years to come. But different businesses will have different needs for a CRM. You may be looking for a system that’s very user-friendly, or one that can automate tasks, or one that can be accessed on multiple devices — or perhaps all of the above. And of course, the CRM you choose should help you build stronger relationships with your customers. With all of the options out there, choosing a CRM can be a bit challenging. However, don’t feel like you need a degree in technology to make the right decision. The process can be as simple as writing down your priorities, then seeing how well the available systems can meet your needs. This is where side-by-side comparisons come in handy. In this series of blog posts, we’ll be comparing our own product (Method:CRM) with some of the other players in the CRM game. Our hope is that these posts will help you decide which online CRM system is best for you. In this post, we’re comparing Method with Insightly. Taking a quick look at a CRM’s website should give you some quick insight into what the product can do for you. 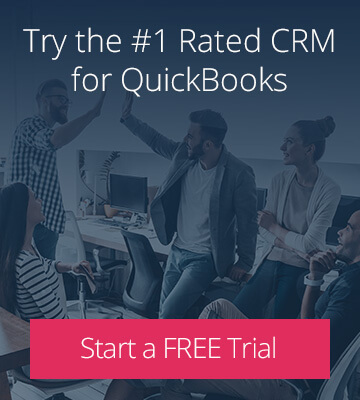 Here at Method, we’re proud to be “The CRM designed for QuickBooks.” Meanwhile, Insightly encourages users to “Know your customers. Grow your business.” Of course, a simple tagline can’t tell you everything! A closer look at each CRM reveals its key features. Built exclusively for QuickBooks users: the patented two-way integration between Method and QuickBooks automatically syncs customer and transaction data, eliminating the need for double data entry. Extensive functionality for lead and customer relationship management: automate lead collection, schedule activities, send emails, manage sales opportunities, and more. Reduce manual administrative work and streamline operations by using Method’s built-in customer portals. Service customer efficiently and drive repeat business with a 360-degree view of each customer. 100% customizable and 100% code-free: create a CRM that’s perfect for your business. Accessible whenever and wherever you need it: Method is optimized for all devices and iOS and Android apps are included in your subscription. Accelerate sales through sales pipeline management and workflow automation tools. Manage leads and opportunities in a pipeline view. Send tracked emails automatically. Deliver projects faster by automating repeat assignments with pipelines. Manage milestones and use workflow automation to ensure on-time delivery. Connect to apps and tools you already use. Capture data and take action from your email inbox. Keep your contacts, calendar, and documents on hand. Track accounting and email marketing from your CRM. Use built-in relationship intelligence to discover connections between your contacts and plan your sales approach. While a CRM’s key features may work for a wide range of businesses, it’s helpful to know if the CRM you’re considering is well-suited for yours. Both Method and Insightly work well for small to mid-sized businesses, and each one can be used successfully by a variety of business types. Method serves customers across many different industries, including manufacturing, construction, accounting, consulting, education, creative agencies, field services, and nonprofit. Insightly’s customers also come from a variety of industries, including accounting, agencies, construction, consulting, education, health and wellness, manufacturing, real estate, and utilities and energy. One of the challenges of adopting a new CRM is figuring out how it fits in with your existing tools. That’s why selecting a CRM that integrates with the software you already use is a smart choice. Here are some of the software integrations offered by Method and Insightly. QuickBooks: Method’s industry-leading QuickBooks sync works with all versions of QuickBooks Online, Pro, Premier, and Enterprise. The powerful two-way integration allows customer, vendor and transaction data to move seamlessly between your CRM and QuickBooks in real time. Gmail: With Method’s free Sidebar for Gmail, it’s like having your CRM inside your Gmail inbox. View your entire relationship with a customer or lead at a glance, from past conversations to overdue invoices. You can also create new CRM contacts, activities, and opportunities right from the Sidebar — no need to switch between programs. Outlook: Much like the Gmail integration, Method’s free add-in brings your CRM into Outlook. When you open an email from a customer or lead, the add-in displays a convenient overview of their contact information, balance, opportunities, and more. You can also save new data directly to your CRM without leaving your inbox. MailChimp: Don’t waste time exporting your CRM contacts and manually uploading them to MailChimp. Instead, send filtered lists of contacts from Method to MailChimp with the click of a button. Google Calendar: Never miss a meeting again. The two-way sync between Method and Google Calendar allows you to view and update CRM activities on whichever calendar you prefer. Google/Gmail: Easily connect CRM records to emails, sheets, docs, and slides, and more. QuickBooks: Increase efficiency by viewing each customer’s account status, invoices, and payments inside Insightly. MailChimp: Streamline your email marketing efforts by exporting CRM contacts to MailChimp and viewing email campaign statistics in Insightly. Xero: Insightly’s integration with Xero provides a complete financial picture of your invoicing and payments within your CRM. Office365/Outlook: View CRM data inside your Outlook inbox, attach OneDrive files to CRM records, and sync events between your Insightly and Exchange calendars. Most CRMs can do a lot more than just manage customer relationships! These are the features that add value to the platforms and set them apart from their competitors. Here are some of the noteworthy features for Method and Insightly. Method:CRM is built on a 100% customizable, no-code platform. This means you and your team can adapt it to better suit your needs — no need to hire a developer. The customization possibilities are endless, from adding simple fields to automating processes to building entire custom apps. 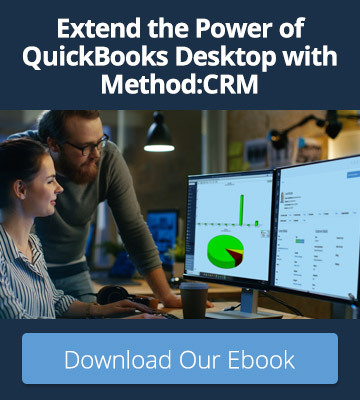 And when combined with the deep QuickBooks integration, Method has the power to become much more than a CRM. Insightly places an emphasis on easy-to-use graphics and visualizations. It also offers a number of features related to project management, including activity sets for repeatable processes, milestone tracking, workflow automation, and file sharing and versioning. Before adopting a new CRM, it’s best to test it out and make sure it works for your business. For this reason, most CRMs offer a no-commitment free trial of their platform. 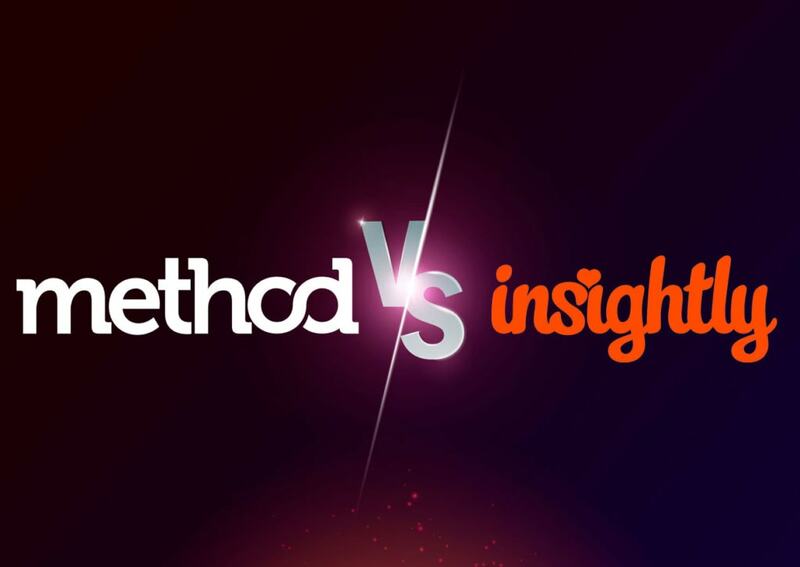 Method offers a 30-day free trial that lets users fully explore the functionality of the system. No credit card is required to sign up. The free trial includes a free hour of customization services with an in-house expert so you can see the true potential of customizing Method for your business. To begin the trial, you must sync your QuickBooks data with your Method account. Insightly offers a 14-day free trial offer with no credit card required to sign up. After the two weeks are up, users can choose to upgrade or downgrade their plan selection. Insightly also offers a free CRM for up to two users; this no-frills plan allows for basic management of contacts, sales, and projects. Price will usually play a key role in your decision to purchase a CRM. Many CRMs offer multiple pricing and subscription options that allow for different numbers of users and features. Here’s what’s available for Method and Insightly. Method offers two subscription plans — Contact Management and CRM Pro. Both plans can be purchased on an annual or monthly basis, with no contract required for the monthly basis. The Contact Management plan is $25/user/month when billed annually or $28/user/month when billed monthly. This plan includes everything businesses need to get started with customer relationship management, including QuickBooks sync, contact management, customer self-service portals, and unlimited customization potential. The CRM Pro plan is $44/user/month when billed annually or $49/user/month when billed monthly. This plan includes all of the features of the Contact Management plan, plus QuickBooks sales transactions, online payment portals, sales pipeline management, and web-to-lead forms. Additional modules for QuickBooks purchase transactions, email campaigns, and case management can be added to either plan for $10/user/month when billed annually or $12/user/month when billed monthly. In addition to the free CRM described above, Insightly offers three paid CRM subscription plans. All plans include the custom Kanban sales pipeline, custom task and project management, custom reports and charts, the mobile CRM app and standard dashboards. The Plus plan ($29/user/month billed annually or $35/user/month) allows for 100,000 records, 2,500 emails, and 50 custom fields. It also includes scheduled emails, custom email templates, and MailChimp auto-import. The Professional plan ($49/user/month billed annually or $59/user/month) allows for 250,000 records, 5,000 emails, and 100 custom fields. It also includes role-based permissions, workflow automation, and priority email support. The Enterprise plan ($99/user/month billed annually or $129/user/month) allows for unlimited records, 10,000 email, and 200 custom fields. It also includes unlimited storage and a dedicated support specialist. Customer support is of critical importance for small to mid-sized businesses purchasing their first CRM. Whether you have a technical issue or just want some guidance on using the product, you want to know that you can get answers when you need them. Method offers a variety of support services including free 24/7 access to its online help center, webinars, and customization resources. Live support is available to all paid and trial CRM customers; support reps can be reached over phone, live chat and email Monday through Friday from 9 am to 6 pm EST. Insightly offers 24/7 access to their online help center, which includes articles, video tutorials, and recorded webinars. Email support is available during free trials and for paid plans during business hours (8 am to 4 pm PST, Monday through Friday). Phone support is also available during business hours for those who purchase a “Success Plan”. These optional training programs are available for $1,500 to $10,000+ annually. For those in search of a cloud-based CRM system, both Insightly and Method well-suited for small to mid-size businesses. Each CRM offers modestly priced entry-level plans in addition to more robust plans for teams with greater needs. Insightly is a great option for customers looking for pre-built sales and project management features, while Method’s deep QuickBooks sync and no-code platform allow users to build customized, scalable workflows for all aspects of their business. Access to free telephone support with Method is another nice benefit for users who are new to CRM systems. Ultimately, the most important consideration when choosing a CRM is to make sure it suits the needs of your business. Sign up for a free trial of each system to see whether it works for you!